Last Mystery Party post! Today's is all about The Plot. A bit in reverse, I know, but I thought we should show you the party elements and get all those distracting details out of the way before telling you the story and how the kids actually cracked the case. At the end of the post, we'll also post-mortem the events of the day itself. So, the story begins with two missing cars and an empty garage. And a very flustered Mr Robert Littlebottom who's called in The Authorities to investigate because, well, his cars are gone. Both of them. Logically, there are four people who could have done it. The repairman was working in the garage the day before the cars were reported missing. The husband came home from work and left his car in the garage. The wife worked from home and moved the cars so the repairman could work in the garage. The mother-in-law was home all day. The repairman left after his work was done but returned later to drop off a tool he'd accidentally taken with him. The husband paid the repairman for the repair work when he'd gotten home from the office. The wife drove one of the cars to the supermarket after dinner, and back again. The mother-in-law took the trash cans out of the garage that night for the collection the next morning. as were some of their fingerprints. 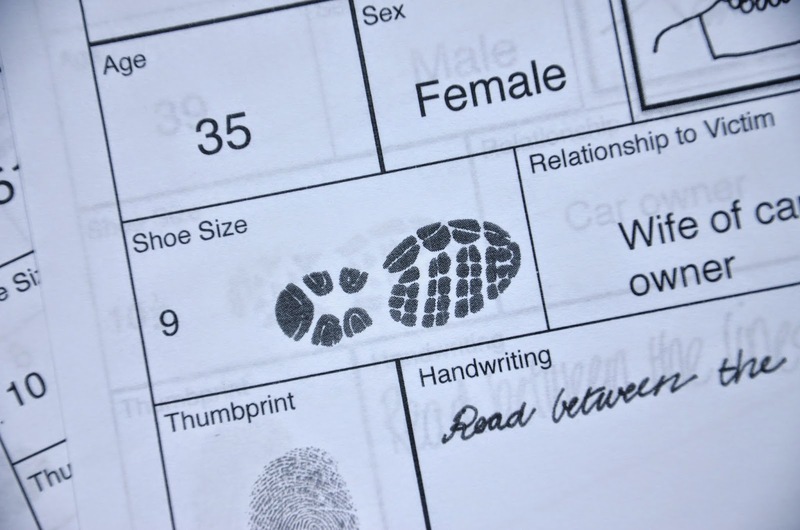 Fingerprint matches were found for three of the four suspects. Along with the prints, a cryptic note was found on the garage floor. 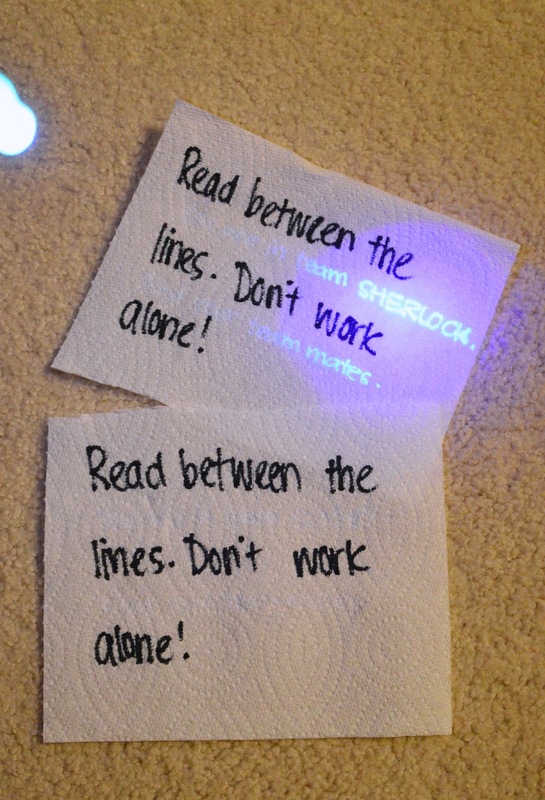 The detectives took the message at face value and tested it for invisible ink with their UV pens. to find that it matched that of the pen belonging to the husband (as did the handwriting on the note). They were now ready to make their deduction: the guilty guy was Richard Littlebottom, the husband. Lots of emotionally-charged exclamations like "it's HIM!" and "I knew it!" accompanied their decision. And they were allowed to open the corresponding Verdict Envelope to find out if they were right (they were happy to discover that they were). But what exactly was Mr Littlebottom guilty of ? And what happened to the cars? 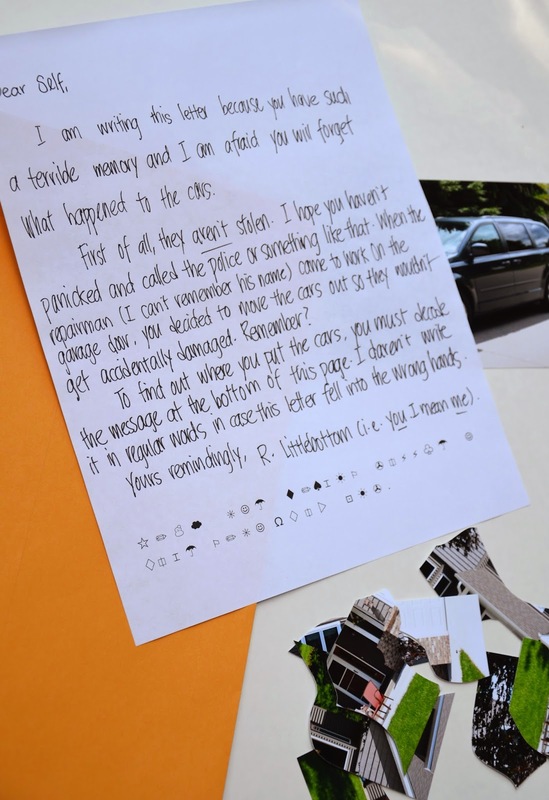 The letter, written by Richard Littlebottom to himself (apparently he has a terrible memory), reveals that there was no real crime after all; he'd simply parked the cars elsewhere to protect them from damage during the home improvement work. And promptly forgot. 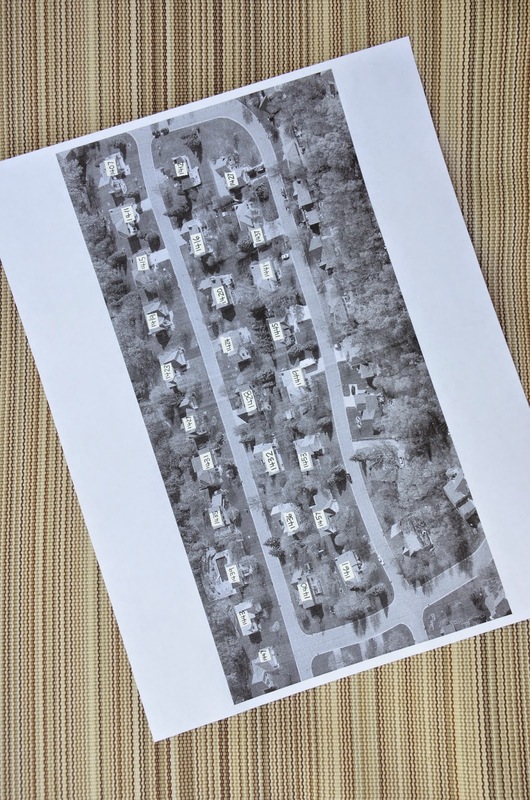 unscrambled to show a house (with a number), presumably where the cars were parked. Using the map of the block, the kids found their way there, and found the cars. We're just like the FBI! You know, like a big bouncy castle in your backyard. Or a petting zoo. Or the indigenous activities at a rented party venue, like a gym or swimming pool or laser tag center or whatever. There are cake, presents and food, not necessarily theme-centric, and the kids spend the entire non-eating duration of the party playing at this Activity. You pick a theme e.g. Superhero, and pull together 2-3 hours' worth of individual Superhero-related stuff, including food, decor, crafts and simple games or activities. For example: DC Marvel cupcakes, Batman pizza and Wonderwoman ice cubes, decorate-able personal superhero capes and masks, Nerf Gun Rescue-the-puppy/innocent civilians/damsel-in-distress war game. Sometimes there isn't even a theme. At such parties, there is a continuity and natural flow to the day's activity, and the party therefore just runs itself without having to do too much traffic direction. There are still some preliminary crafts but they are incidental to, and merely help set up, the main thing. Emily's previous Fairytale Quest party was like that. And so is this Mystery Party. The natural progression of the plot automatically took the kids from segment to segment until the very end. We like these kinds of parties because they are like a huge pretend-play adventure. However, they are not without their challenges. For instance, because the pace proceeds at sort of a linear fashion from start to finish, unless everyone "got" what was going on, we'd end up with people needing help and going at crazy different speeds and some even being left behind. Happily, having the kids work in teams solves this to a very satisfactory extent. Next, this was a very elaborate mystery plot, far more complex than the kind of mystery-themed party I'd have designed for 8-year-olds and two kindergarteners, had I been the one to call all the shots. However, this was Jenna's party, and in our family, we try to accommodate as many of the kids' ideas as are practical, rather than turn it all horribly adult-centered, thereby missing the point completely. 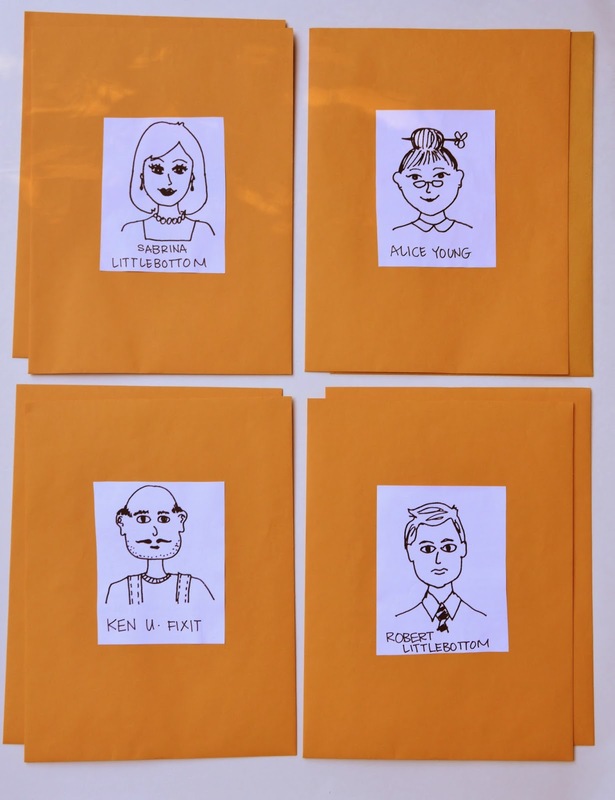 Most of these ideas were Jenna's, down to the clues and suspects and fingerprint dusting and spy-style ciphers and whatnot. When we'd sat down, in all her giddy excitement (and all my sobering practicalness), to tease out a working framework from those ideas, I realized that she was unwilling and unable to choose just one of the mystery, spy, secret agent, detective, adventure, criminal profiling, forensics, science genres. And it was understandable- they were very similar. So we let her do a little of all. It was thrilling for Jenna, for whom riddles and logic puzzles are wonderfully engaging. Which while mission accomplie, might unfortunately have been a little over the heads of some of her peers attending that day. Q Did everyone solve the mystery easily? A Both teams correctly picked the guilty guy on their first guess. One team was quite certain throughout their investigation, and the other team was somewhat divided before coming to a consensus at the end. Q Was there enough time to solve the mystery? A Our particular mystery, with all its details, would've been more fully experienced with more time, honestly. 2 hours with facilitated brainstorming would've been wonderful. We only had an hour, and no facilitators. Most of those 8-year-old kids had never read mystery stories or, at least, had no concept of the logical sequence of deduction or elimination or whatever. I'd love to run this as a controlled class activity for, say, 4th graders. It would've been perfect. Q So 8-year-olds were a bit young, then? A Yes. And let's not forget the two kindergarteners. If you do this theme with kids this young, sacrifice the whole accuracy issue and pitch it as an adventure quest rather than a logic puzzle. And keep shouting out hints to them. Very obvious hints. Q What parts of the party worked well? Putting the kids in teams to work together. They loved working with other people and the feeling that it was a kind of a friendly competition against the other team. Having the two teams EACH hunt for ONE of the cars was great- there was no competition (and therefore no stress) for the same prize. Color-coding the clues was helpful because the kids could easily tell when they'd collected all the items they needed to find. Matching the colored shoeprints they found at the crime scene with the sample prints in the dossiers - they were easy to tell apart, even without using a measuring tape. 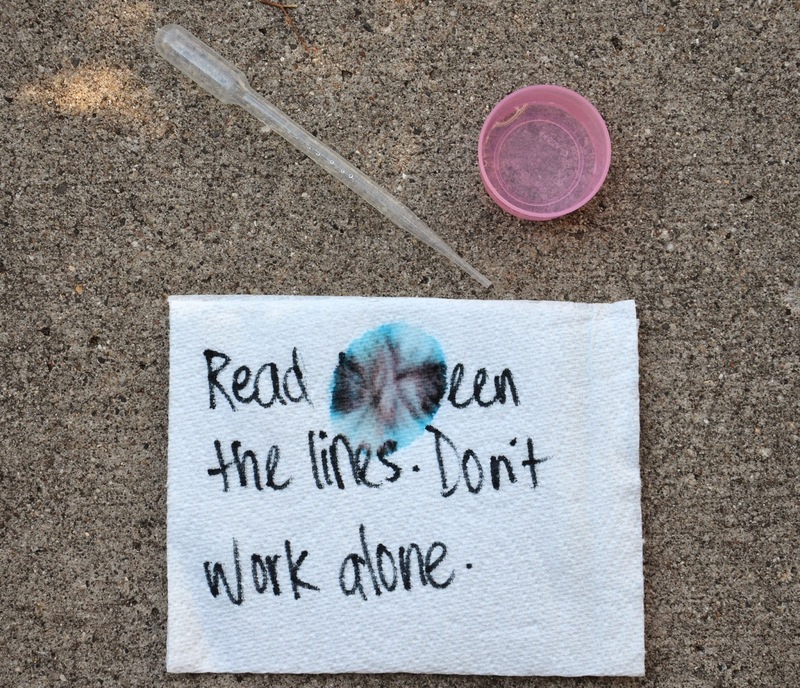 The invisible ink and chromatography - high wow factor and a bit like magic. 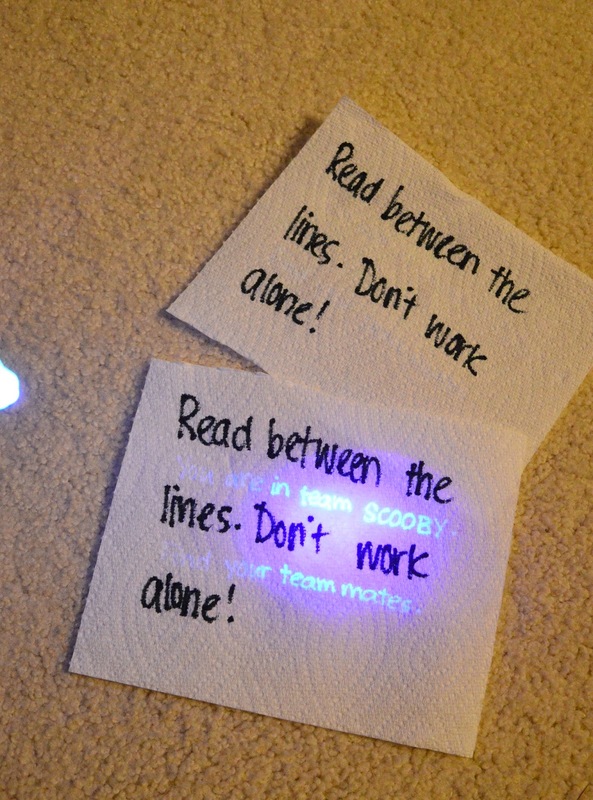 Even the littlest kids could tell they'd discovered something "pertinent to the case" when they saw the glowing words show up and the ink smear into colors. We didn't even have to hint that the kids should use their pens. 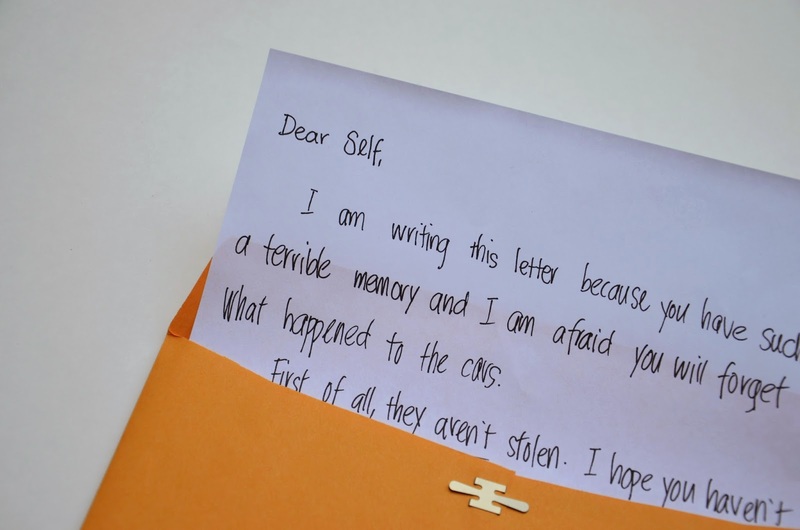 They instinctively suspected something was hidden in the message and decided to act on it. 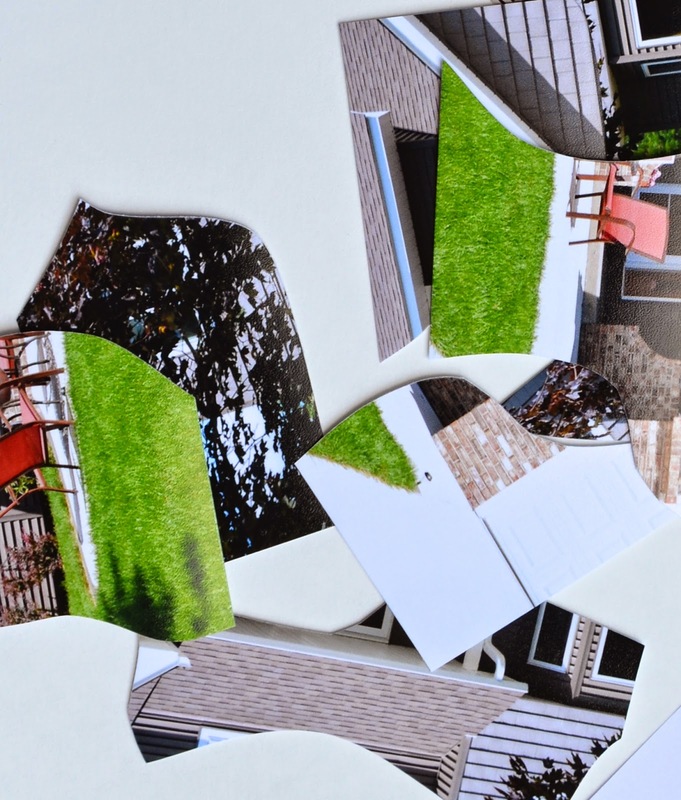 The photo puzzle was a fun activity to do together in a team. Locating the house on the map, and then physically hunting for the house on the street, because it was a bit like a treasure hunt. Q What didn't work so well? A My first impression was that this was the kind of game that needed a lot of processing time. All the kids understood that there was a mystery and they had to find clues to solve it. However, the evidence, as they often say in the movies, was overwhelming. While older kids would've had a blast in the one hour that we had, our younger kids would've gotten a lot more out of the activity if we'd had more time and more facilitators. Some of the segments requiring actual analysis and deduction were quite beyond them. 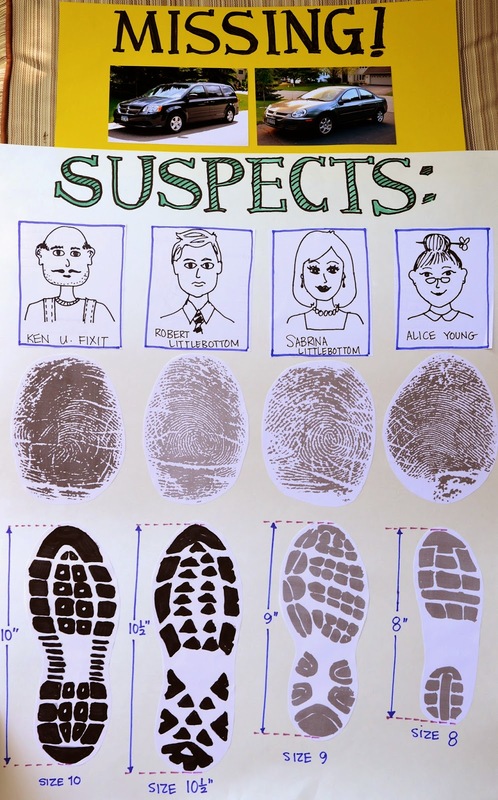 For instance, apart from the older kids (we had some 10- and 12-year old siblings), most of the kids had no idea how to use the suspect chart to organize their findings. They also couldn't see the connection between eliminating suspects and getting closer to identifying the final Guilty Person. 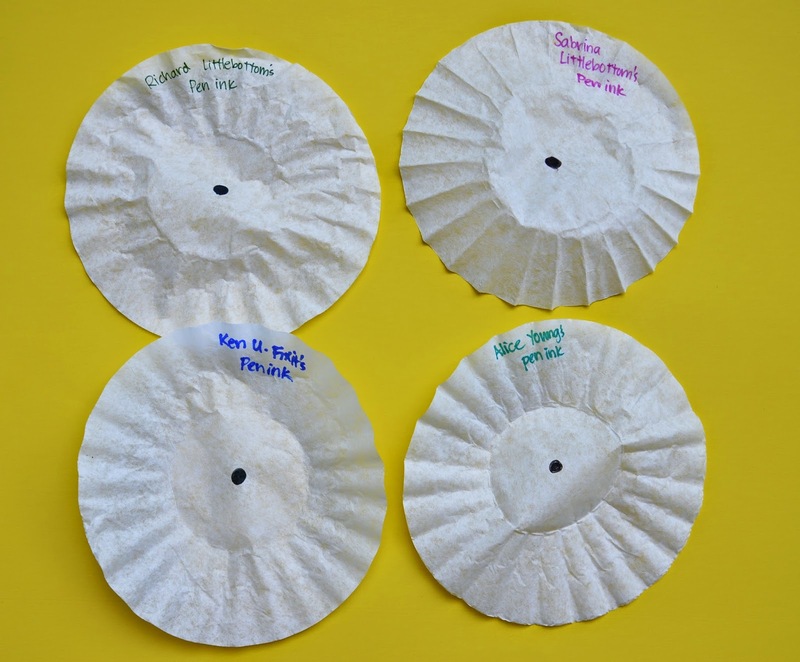 Almost all of them had never done chromatography before, and weren't sure how that identified ink sample was more significant than the others. The fingerprint activity was a hit only up to the point of scratching off the silver layer (whoo! Wow! Fun! ); scrutinizing the actual prints while racing against an imaginary clock was more a miss. Finally -surprisingly- the sentence in substitution code at the end of the letter was quite challenging for the kids to sit still and decipher - some of them just wanted to go car-hunting, clueless or no. Q If you could do it again, how might you do this differently ? have only two suspects (and aim to eliminate one). not bother with the fingerprints at all. Sorry, Jenna. have only one incriminating bit of evidence e.g. 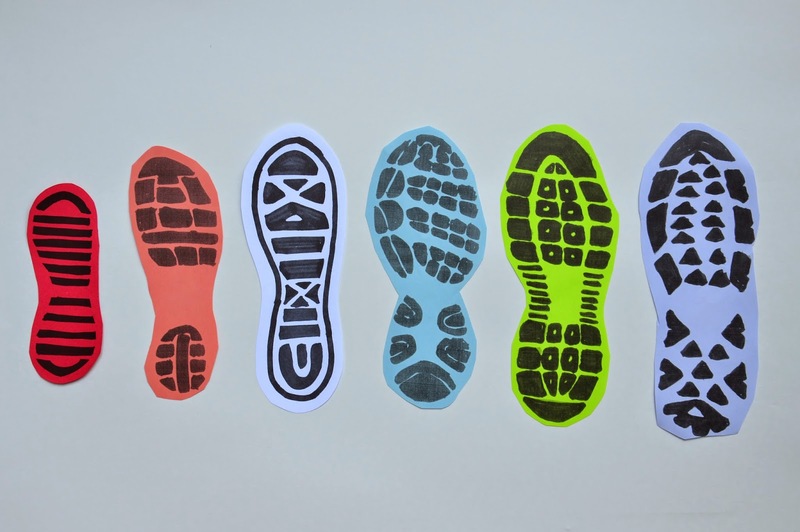 a shoeprint or the ink sample. 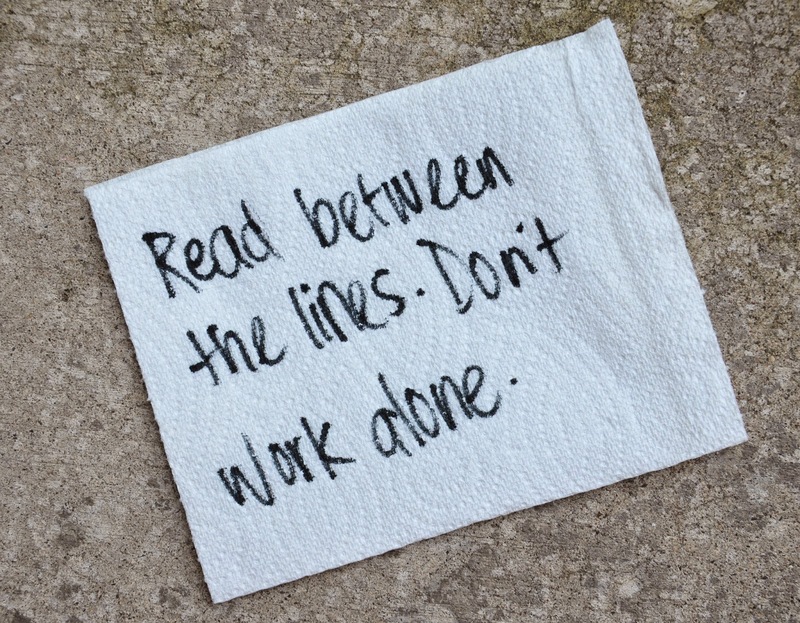 have everyone work in teams from the start. Team solidarity is awesome. 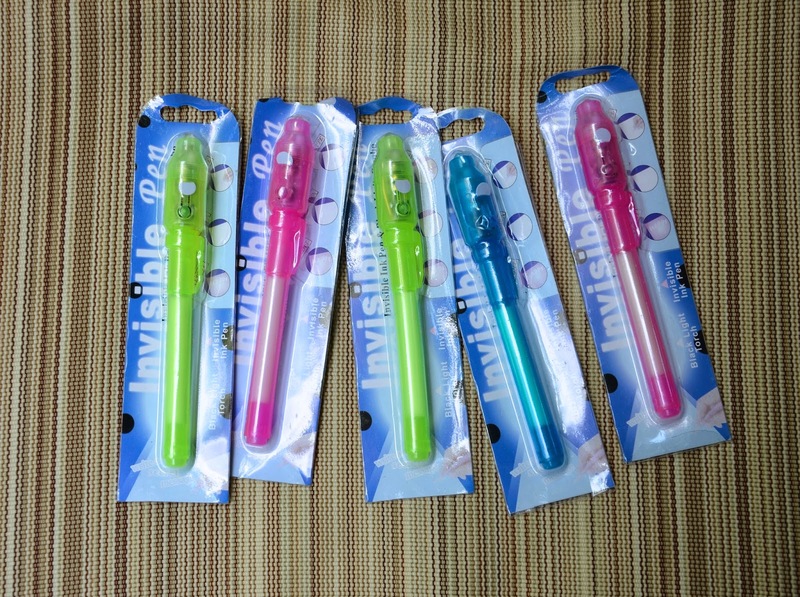 favor lots of visual secret message type things (invisible ink pens and anything that looks like magic) and hand-eye coordination stuff (e.g. jigsaw puzzles and searching) over anything mental (e.g. analysis and deduction). 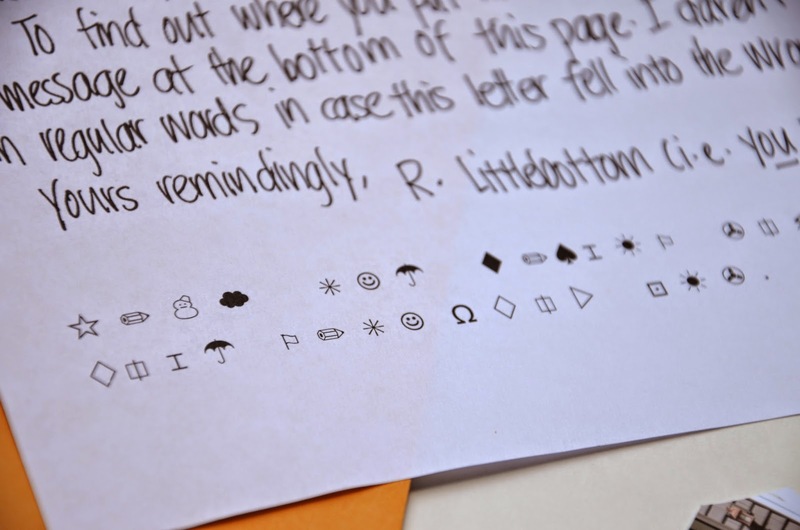 turn the whole thing into a treasure hunt. The more running around and seeking there are, the better. Now, as a class activity or a summer camp afternoon session, in which we'd not be limited to an hour and/or multiple-age participants, it would be another story altogether, and they might even say that this mystery didn't have quite enough twists or red herrings to make it truly suspenseful. Jenna, though, knew exactly what was going on, and loved it. Maybe because it was her mystery from the start. 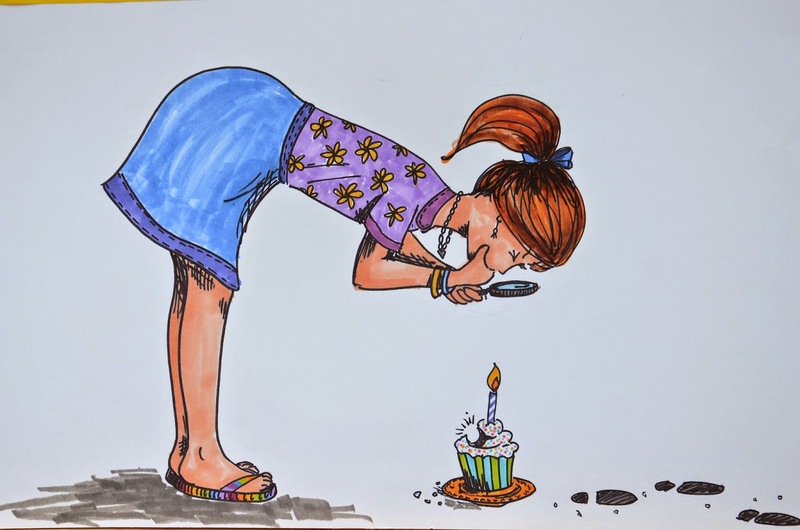 We know that she was quite thrilled to see how her ideas played out on that day and, later, to recount to any adult who would listen, the plot and how they solved the mystery. And for days after, she and her sisters (and their neighbor friend who was one of the guests) played mystery and deduction with their kits, running around the yard and in the house. I'm taking a quick break from party blogging to share some random updates in the next few posts, and after that, I'll report on Emily's Science Party. Since first posting this, many, many readers have asked if I'd consider making a Mystery Party Package with all the documents and stuff available for sale, and initially, I said no, largely for privacy reasons (those fingerprints, shoe sizes, vehicles and neighborhood maps belong to people we know personally). 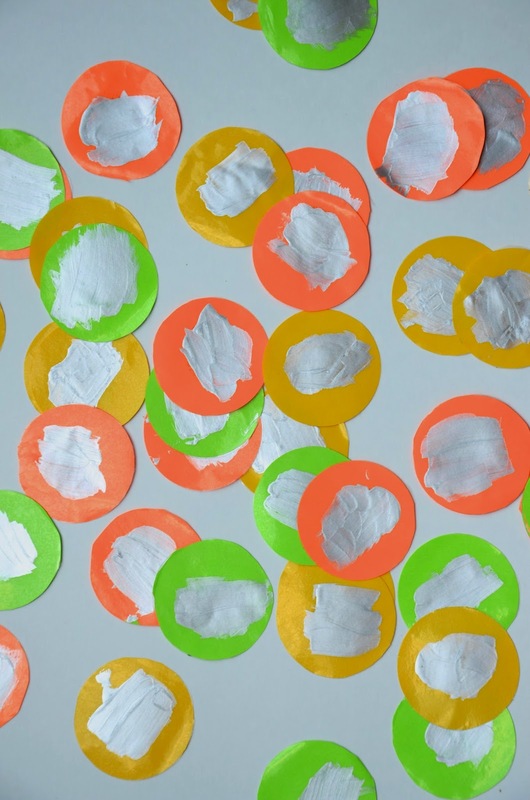 But also because I felt that after seeing how the activities played out with real children during the party, some tweaking was necessary in order for you guys to use the materials with your own kids and students. 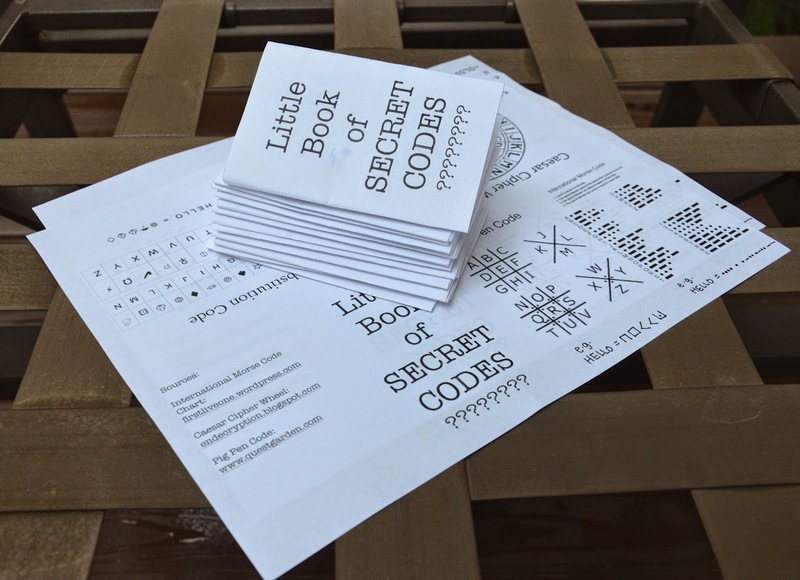 I am happy to say that those changes have finally been made and you can now purchase the Mystery Party materials as a 30-something page pdf file. I've put in as much as I could, including the dossiers, footprints, suspect charts, original artwork for stickers, labels and invitation cards, as well as instructions, a proper Mystery Synopsis and Case Solution. You can find them in this post. Great party setup! I would have loved to come to parties at your house when I was i kid :-) Haha - love your Q and A: Because! Despite a few things that didn't seem to work so well, it was an amazingly well-thought-out party, and no doubt the kids had all kinds of fun! So you learned a few things in the process... and so did the kids! Can't beat that! We recently had a short 8-year-old party, too. (The 8-year-old is small for his age, and we didn't have much time.) Not being as organized as you are, I racked my brains and finally came up with a couple of games. But, when the (mostly older) guests arrived, said 8-year-old took charge and led them in a game that, I believe, he made up on the spot. I'm really not sure what they were doing, but it took up the allotted time, and I think the guests enjoyed it. Precocious kids are a hoot, aren't they? My last ultra ambitious party was loosely based on your last one - it was book themed, but as it took place totally in one room, the 'treasure hunt' took place among four posters on the walls featuring various animals reading books. The clues were partly in a little copy each guest had and included basic crossword, word search and the like, and partly on the posters - the relevant square was identified by alphabet and numbers, like in maps, and the first letter of the animal name and the number on its book led to the second clue and so on. Sadly the clue verses left them all baffled (and not at all impressed by the cleverness of it). And we had had so much fun planning it too! Just one drawback when you guide your kids to an intellectual level bit higher than their peers, isn't it? As a guided classroom activity, it'd be so much better! It is amazing! I was creating parties like this for my daughters 15-17 years ago.... probably I need to start it again for my grades 3-4 now.I keep this idea many years but do not have somebody special who push me in to. My be you are)))) Thanks a lot, I will link it in my blog. I love reading about all your parties. I would love to do something like that some day (and at the same time I'm glad that birthday parties in Norway are a lot simpler :p ). I second the idea of a party book. Even if you don't feel like doing one now you shoudl definitly save your stuff for a book in the future. I'd sign up for my copy already today!